The maven-release-plugin is used to automate a lot of the manual steps involved in releasing new versions of your software. The automation prevents mistakes which ultimately occur using a manual process. The amount of work the plug-in does is impressive – it will perform these basic operations. If you work on one project, performing all these steps manually may not be a big deal. But if your enterprise consists of multiple projects with dependencies between them, the automation provided by the maven-release-plugin saves time and prevents mistakes. This is why I needed to get the maven-release-plugin working. The homepage for the plugin ( http://maven.apache.org/plugins/maven-release-plugin/) will tell you everything you need to know about the plugin except how to run it! Think about the technologies the plugin is integrating. Consider CVS. Should be simple enough to integrate CVS; just configure the project with the CVS connection string. 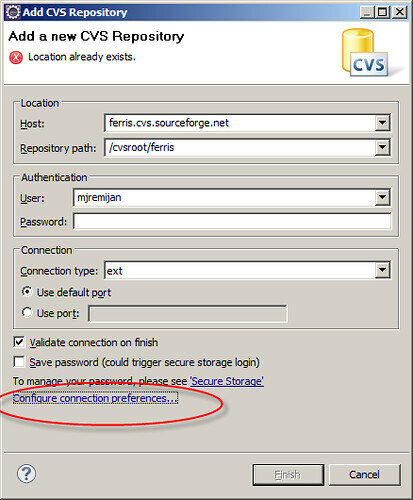 However, SourceForge.net requires an SSL connection for write access to a CVS repository. This means integration with something like SSH. Now that SSH is involved, do you really want to put in your username/password every time a connection to the CVS repository is needed? No? This means integration with public/private key pairs on both the client and server side. See how quickly this gets very complicated. Now throw in the Windows operating system where SSH and CVS binaries are not as readily available as on a Linux environment and you have yourself a configuration nightmare. The purpose of this article is to document the steps needed to configure all the technologies which the maven-release-plugin will need to work with a regular Maven repository and with a CVS repository requiring an SSL connection. If you are an open source developer using a CVS repository on SourceForge.net, a standard Maven repository, and your primary OS is Windows, then this article is for you. If someone has a different way of doing this, please contact me! It took me over a week of putting together different Internet resources to get this working and given its complexity I have a feeling there has to be an easier way. There are many steps required to get all the technologies configured correctly for the maven-release-plugin. Before we begin, here is an outline. SourceForge.net requires an SSL connection for write access to your project's CVS repository. I am going to use SourceForge.net for this article however the configuration steps in this article can also be applied to any CVS repository requiring SSL. Normally connecting to a SourceForge.net CVS repository over SSL is not a problem. 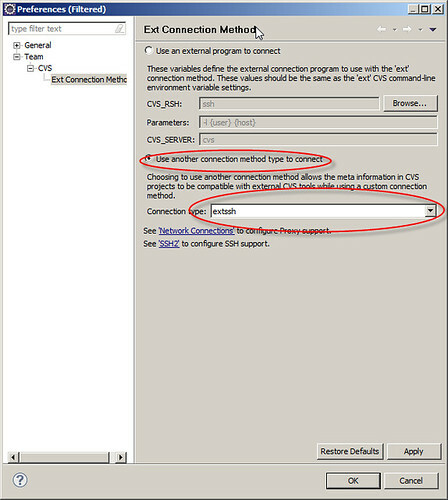 Configure the CVS connection in Eclipse to use the "extssh" connection type and enter your username and password when prompted. It is not so simple when you want to use the maven-release-plugin later. If you do not already have a SourceForge.net account, go the website and create a new account and a new project. 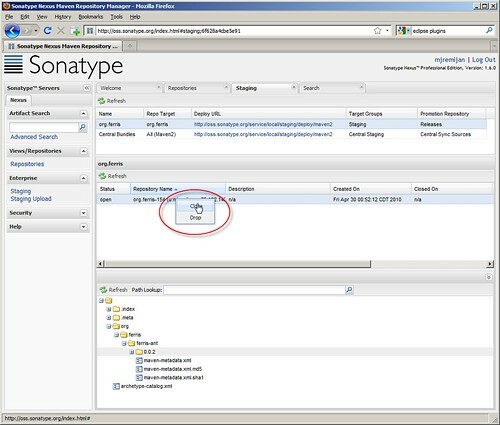 Sonatype recently opened a Maven repository at http://oss.sonatype.org for open source developers. 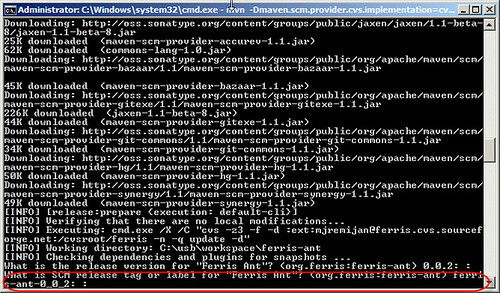 Like SourceForge.net giving you a CVS repository to put your source code, Sonatype OSS Nexus gives you a Maven Repository to put your artifacts (both RELEASE and SNAPSHOT). Your account at OSS Nexus can be configured to promote your artifacts into the OSS Nexus public "Releases" repository or into the Maven main repo (http://repo1.maven.org/maven2). If you do not already have an OSS Nexus account, go to the website and create a new one. You are going to need all this software. CVSNT recently became CVSPRO with a paid commercial version. There is a community edition still available which is free however the first time you use cvs.exe, a popup dialog box appears asking to buy the PRO version and you just have to wait for it to go away. If you can find a previous version of CVSNT, use it instead. When you go to the URL listed above to download CVSNT, Click on the "All Downloads" hyperlink at the top. 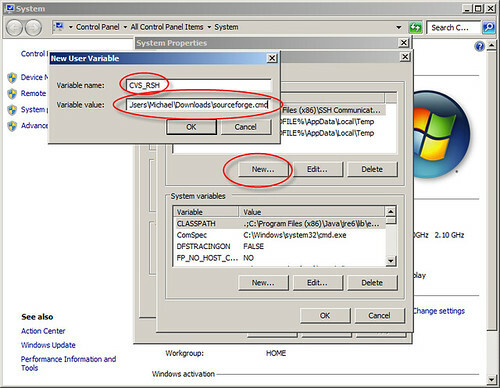 In the dropdown list of downloadable products, select "CVSNT Community Command Line Client 2.5.05 for Windows" (see figure 1). Download and install it on your computer. Puttygen is used to generate a public/private key pair so SSL connections can be established without having to enter a username and password every time. Plink is a command-line connection tool similar to ssh. It will allow SSL connections from your computer to your CVS Repository on SourceForge.net. 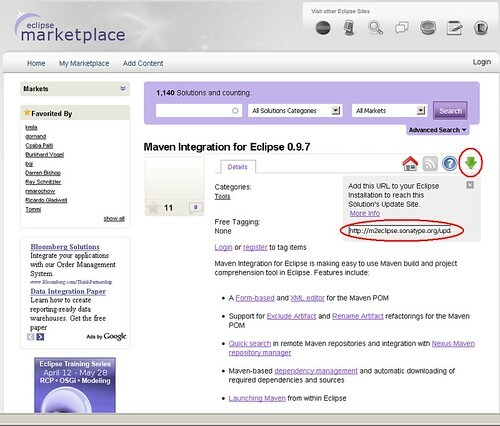 M2Eclipse is an Eclipse plug-in for working with Maven projects and Maven repositories. The URL above takes you to the M2Eclipse plug-in homepage. Click the green arrow to get the URL for the plug-in update site then add that URL to Eclipse to install the plug-in (see figure 2). The cvs.exe binary needs to be added to the Windows system PATH. Follow these steps (see figure 3). Select "PATH" from the list. Paste in the fully-qualified path to the CVSNT directory (Your CVSNT directory may be different than the one shown in the screenshot). Click all the "OK" buttons until all the windows are closed. After adding the CVSNT directory to the PATH, let us check to make sure it worked. To do this, first open a Windows Command Prompt (or DOS Prompt) now needs to be opened. Follow these steps (see figure 4). Type "cmd" in the search box. To check the cvs.exe binary is on the PATH correctly, execute the cvs.exe command. The results will be similar to figure 5.
your PATH is not set properly. Fix this before continuing. Puttygen.exe will now be used to generate a public/private key pair. This is necessary for communication with your SourceForge.net repository over SSL. The public/private key pair will allow the communication without prompting for a username/password every time a connection is made. Double-click puttygen.exe to run the application (see figure 6). To generate a new public/private key pair, follow these steps. Save the public key in a file named "MyKey.pub"
Save the private key in a file named "MyKey.ppk"
You now have a public/private key pair which you will use for SSL communication with your SourceForge.net CVS repository. Keep the PuttyGen application running! 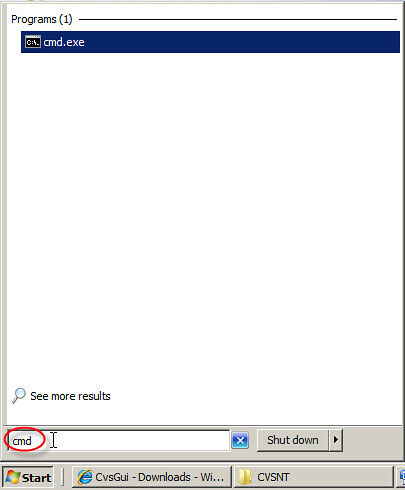 You will need it open during the next step which is to configure your SourceForge.net account. For SSL communication with public/private key pairs, the private key always remains secret and protected on your computer. The public key, however, is put onto whatever system you are communicating securely with. In this case, you will be communicating securely with your SourceForge.net CVS repository. So you need to put the contents of your public key on your SourceForge.net account. Follow these steps (see figure 7). Login to your SourceForge.net Account. Click the "Account" hyperlink in the upper-right corner of the page. Click the "Edit SSH Keys for Shell/CVS"hyperlink. You will now be able to see the SSL public keys on your SourceForge.net account. If you have just created an account or you have never put a public key on your account, the text area of keys will be blank. 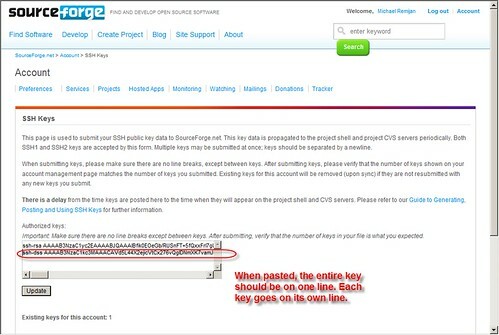 To get your public key on your SourceForge.net account correctly, follow these steps. PASTE the contents of the public key on a new line of your list of keys (see figure 9). When you paste, the entire key should be on a single line – the key should not be broken up into multiple lines. If you have more than one key on your account, each key is pasted on its own line. Do not have an extra line between keys. Plink is a command-line connection tool similar to ssh. It will allow SSL connections from your computer to your CVS Repository on SourceForge.net. After having completed the creation of a public/private key pair and putting the public key on your SourceForge.net account, it is now time to see if Plink will work in establishing a secure SSL connection. Instead of using the plink.exe binary directly, we are going to create a small Windows command file so configuration parameters can more easily passed to Plink. Follow these steps. Save the file as "sourceforge.cmd"
Now we are able to test Plink and see if an SSL connection can be made from your computer to your CVS Repository on SourceForge.net. Follow these steps. Open a Command Prompt (DOS Prompt). 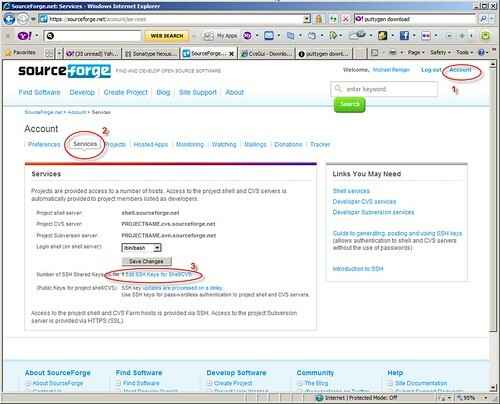 Change directory to the location of the "sourceforge.cmd" command file. You will be prompted for your username as plink.exe prepares to make the connection. Once connected two things will happen. First, a short welcome message will be displayed showing you have successfully connected. Second, the connection will be immediately terminated because this is a non-interactive shell (see figure 10). If this worked, congratulations! You just successfully established a SSL connection with SourceForge.net using your public/private key. If not, fix this before continuing. 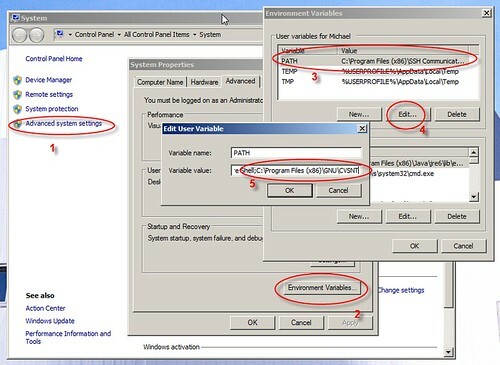 CVS relies on a System environment variable named CVS_RSH to tell it where the program is located which is capable of creating SSL connections. For Linux, this is typically ssh. For Windows, we have plink.exe. More specifically, we have the "sourceforge.cmd" command file created in the previous step. A new System environment variable named "CVS_RSH" must now be created pointing to the "sourceforge.cmd" command file. Recalling how the System PATH was configured, follow these steps (see figure 11). Set "Variable name:" equal to "CVS_RSH"
Set "Variable value:" equal to the fully qualified location of the "sourceforge.cmd" file. Open a NEW Command Prompt (DOS Prompt). I emphasize the word NEW here. If you already have a Command Prompt open you must close it and open a new one. When this command is executed the first time, you may get a dialog box from CVSPRO asking you to purchase the software. You just have to wait until the dialog box goes away. After it does, your command will be executed. If successful, you will see a listing of the directories in your SourceForge.net CVS repository (see figure 12). If not, fix this before continuing. Up until now we have been concentrating on CVS and your account at SourceForge.net. All the configuration done to this point allows you to establish a secure SSL connection from your computer to your SourceForge.net CVS repository using public/private key pairs. Now we are going to concentrate on a Maven repository and your account at Sonatype OSS Nexus. We are going to configure Maven so your computer knows how to resolve dependencies deployed to Sonatype OSS Nexus and how to deploy your artifacts to Sonatype OSS Nexus. If you have not visited the Sonatype OSS Nexus webpage and created an account, do so now. The %HOME%\.m2\settings.xml file is a standard Maven configuration file and is where we will be starting the Maven configuration. This server configures the username and password used by Maven to connect to the repository to which your SNAPSHOT artifacts will be deployed. NOTE – The URL of the snapshot repository is not defined here! It will be defined later in your project's pom.xml. This server configures the username and password used by Maven to connect to the repository to which your RELEASE artifacts will be deployed. NOTE – The URL of the release repository is not defined here! It will be defined later in your project's pom.xml. OSS Nexus does not allow direct deployment into its public "Releases" repository. OSS Nexus is configured to deploy your artifacts to your staging repository first. After your artifacts are staged, you need to login to the OSS Nexus website to manually promote them to the public "Releases" repository. This staging allows you time to check the staged artifacts are correct before putting them into the public "Releases" repository. Once in the public "Releases" repository you cannot change them. This repository defines the OSS Nexus public "Releases" repository. Once your artifacts are promoted from your staging repository, they are publically available from this repository. NOTE – This is put into a <profile>. This repository defines the OSS Nexus staging repository. Because your artifacts are staged first before they are put into the public "Releases" repository, this repository configuration allows Maven to resolve dependencies which you have staged but not promoted to the public "Releases" repository. This repository defines the OSS Nexus snapshot repository. If you are working on a project with multiple developers, this repository allows the team to resolve dependencies on the latest snapshots. Snapshots do not go into staging first. Snapshot cannot be promoted into the OSS Nexus public "Releases" repository. There are two parts of Eclipse to configure. The first is the Eclipse connection to your SourceForge.net CVS repository. The second is the Maven Indexes of the M2Eclipse plug-in. If you have not installed the M2Eclipse plug-in, do so now. When we edited the Maven settings.xml file, we did so to enable Maven to resolve dependencies deployed in the OSS Nexus repository. We now need to do a similar configuration for the M2Eclipse plug-in. If you right-click on a Maven project and select "Add Dependencies", the artifact search feature of M2Eclipse can only find artifacts in the repositories listed in the "Maven Indexes" view. In order to find your artifacts in the OSS Nexus repository, open the "Maven Indexes" view and add the three repositories shown in figure 13. By default, Eclipse comes with the "CVS Repositories" view so there is no need to install it. Open the "CVS Repositories" view. We need to add your SourceForge.net CVS repository to the list. NOTE - Even if you already have your repository configured you will need to remove it and add it again! The reason why will be given later. Set the "Connection type:" dropdown box to be "ext" (see figure 14). It is very important to set the value to "ext". DO NOT click the "Finish" button yet! 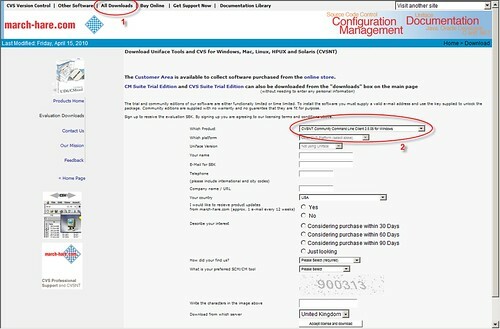 Select the "Use another connection method type to connect" radio button (see figure 16). Select "extssh" from the "Connection type" dropdown box (see figure 16). This configuration tells Eclipse it should treat the "ext" connection type as its internal "extssh" connection type. Click the "OK" buttons until all the windows are closed. After all the windows are closed, the connection to your SourceForge.net CVS repository has been configured within Eclipse. Although you configured the connection type as "ext", Eclipse will treat it as its internal "extssh" connection type. 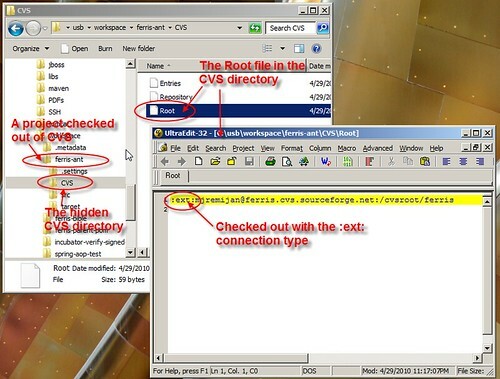 Test the connection by getting the list of directories in your SourceForge.net CVS repository. Eclipse will prompt you for a password. Eclipse will then use its internal ssh implementation to connect. When you check out a module (and this is the important part), the hidden CVS/Root file will have "ext" as its connection type (see figure 17). This is vital for getting the maven-release-plugin to work. 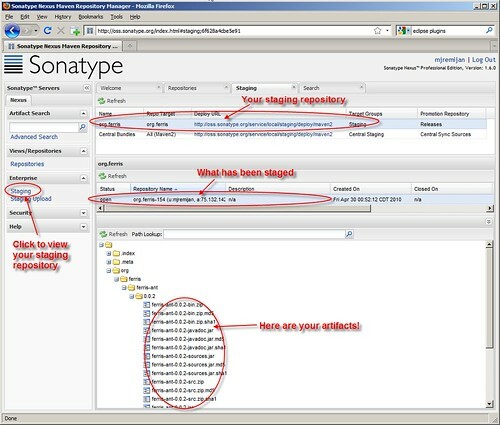 It is now time to check out your project from your SourceForge.net CVS repository. NOTE – If you already have your project checked out you need to delete it and check it out again using the Eclipse CVS Repository configured with the "ext" extension. If you do not do this, then the maven-release-plugin will not work. 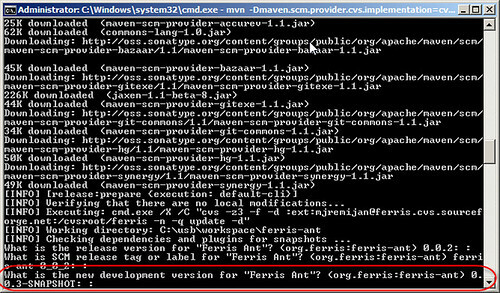 Assuming you have checked out a Maven project from your SourceForge.net CVS repository, it is now time for the final configuration – configuring your project's pom.xml. 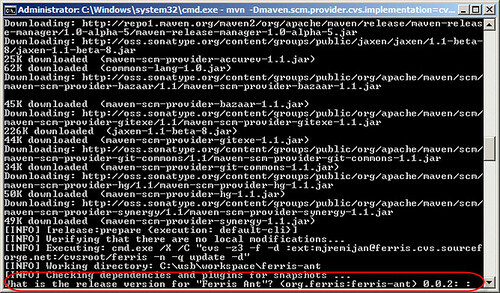 The <scm> tags hold information so Maven knows about the CVS repository the project came from. 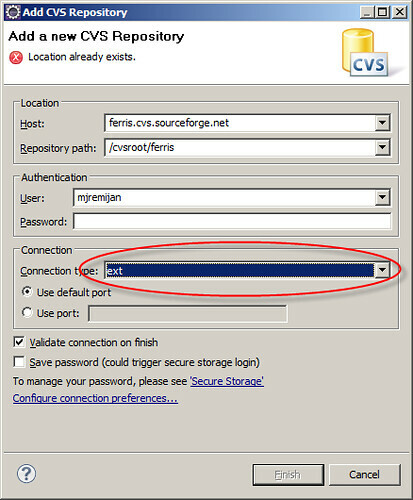 You will need to configure the <scm> tag with information about your SourceForge.net CVS repository. This information must go into each project's pom.xml. If your development group has a parent POM project, the <scm> information must still go into each project's pom.xml because the information is unique to each project. This tag is configured for anonymous pserver (non-ssh) access to a module in your SourceForge.net CVS repository. This tag is used by the maven-release-plugin. You do not have to worry about it right now. This tag is configured for your developer ext (ssh) access to a module in your SourceForge.net CVS repository. This tag is the URL to your project's homepage. The <distributionManagement> tag holds a lot of different information. In our case we want to configure a <repository> and a <snapshotRepository>. Remember back when the settings.xml file was configured with the username and password needed to deploy artifacts to the OSS Nexus repository? Remember the URL to the repository was not configured in settings.xml? The answer to where the URL to the repository is configured is pom.xml. If your development team has a parent POM, this configuration can go in the parent POM. This tag defines the location of your OSS Nexus staging repository. When you execute "mvn deploy", your RELEASE artifacts will be staged to this repository. After your artifacts are staged, you need to login to the OSS Nexus website to manually promote them to the public "Releases" repository. The <id> values from settings.xml and pom.xml MUST MATCH! If the <id> values do not match, Maven will be unable to find the correct username and password to connect to this repository. This tag defines the location of the OSS Nexus snapshot repository. 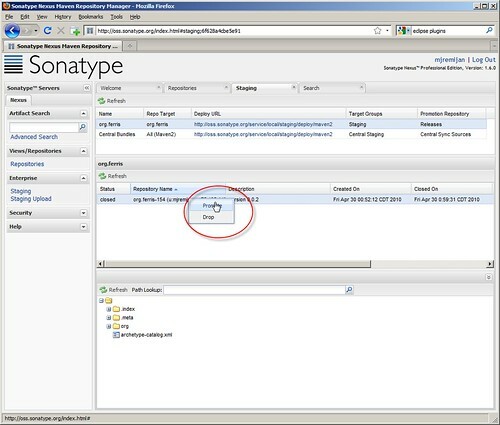 When you execute "mvn deploy", your SNAPSHOT artifacts will be staged to this repository. Before continuing, let us review what has been done so far. Downloaded and used puttygen.exe to generate a public/private key and set the public key in your SourceForge.net account. Downloaded and configured plink.exe to allow cvs.exe to connect to your SourceForge.net CVS repository using SSL. Configured Maven for the Sonatype OSS Nexus repository. Configured Eclipse's m2eclipse for the Sonatype OSS Nexus repository. Configured your project's pom.xml for both your SourceForge.net CVS repository and the OSS Nexus repository. It is finally time to run the maven-release-plugin! Our goal is to have the maven-release-plugin automate the deployment of a new version of your project to your OSS Nexus staging repository. Edit your project's pom.xml file so the version ends with "-SNAPSHOT". If you do not do this the maven-release-plugin will complain. Commit the changes to the pom.xml file to CVS. If you do not do this the maven-release-plugin will complain. Change to your project's directory. If all goes well, you will first be prompted for what version this release will be. The maven-release-plugin removes the "-SNAPSHOT" from your pom's <version> tag and assumes it is the next version. If it is, just press enter. If not type in the correct value for the next version then press enter (see figure 18). Next, the maven-release-plugin will ask you for the name it will use to tag this version in CVS. Again, the maven-release-plugin makes an intelligent guess for its value. If it is correct just press enter. If not type in the correct value for the CVS tag then press enter (see figure 19). Finally, the maven-release-plugin will ask you for the name of the new SNAPSHOT version. Again, the maven-release-plugin makes an intelligent guess for its value. If it is correct just press enter. If not type in the correct value for the next SNAPSHOT version then press enter (see figure 20). . . .BUT YOU ARE NOT DONE YET! If this is successful and you get another. . .
. . .congratulations! You have successfully configured all the technologies which the maven-release-plugin needs to work with a regular Maven repository and with a CVS repository requiring an SSL connection. Since running the maven-release-plugin was successful, your project's RELEASE artifacts are waiting in your OSS Nexus staging repository. You now need to login to your OSS Nexus Repository, verify your artifacts are properly staged, and finally promote the artifacts to the OSS Nexus "Releases" repository. Optionally, your artifacts will be promoted to the Maven main repo (http://repo1.maven.org/maven2) if your account is configured to promote there. Verify all the artifacts for your release are properly staged. Once verified, continue to the final step, promotion. NOTE - At any point you can select "Drop" instead to remove it from staging. Re-run the maven-release-plugin to try again. Congratulations! Your artifacts are now in the OSS Nexus "Releases" repository. Make sure you follow each step of this document from top to bottom. Do not continue to the next step if you are not successful at the one you are on. I had a positive experience with descriptive error messages and finding solutions for them online. If you get stuck, search for the solution. The maven-release-plugin has 2 goals I did not cover. Make sure you read about these. Have patience. It might be difficult to get working but the effort is rewarded with the ease coming from automating the complex release process.